Creating repurposed and upcycled projects for the yard- particularly birds- is something I just can’t stop doing! But this one is different- I promise. This idea came about from two unrelated thought paths in my head: (1) What could I repurpose to create a holder for bird nest material?, and (2) When will I finally be creative with old, rusty bed springs? Hmmm, what can I do with these? NOT fans of my camera! I’ve emptied out the remains of the last nest and am hopeful this spring will bring new babies! But this year, I’m hoping to help out the feathered parents-to-be by providing fun, fresh nesting material. This post contains affiliate links for your crafting convenience. Before I started constructing my “cage” from old bed springs, I gathered my stuffing- most of which would be this stuff: Audubon-approved natural nesting material. So cool, right? It’s fluffy goodness from some yet-to-be-identified seed pod. But I wanted to add some other materials to my nesting material holder, as well…so I gathered a few additional natural elements: dried grass from the yard and Cottonball fur. You read that right- Cottonball fur. As long as you don’t treat your pets for fleas/ticks, pet fur is highly recommended as nesting material for song birds! Now, to turn my bed springs into cages, of sorts, I just needed to do a couple of things using some low-gauge jewelry wire (I chose to use a matching bronze wire). First, I added two pieces of wire along opposite sides of my bed springs , simply wrapping the ends around the spring. Then, I started layering everything in- my Audubon-approved bird nesting material, 3”-5” strands of various strings, Cottonball fur, and stems of grass. I packed it in my bed springs but not overly tight- I want the little birds to be able to tug stuff out for their birds nest ! It looks a little weird, I know-but kind of nifty at the same time. Weird, abstract, native-style art? Or DIY nesting material holder?? To finish it off, I added a strap of wire across the top of my bed springs (it disappeared into the fluff! But it’s there- I promise!) and then created a hanging handle with an additional piece of wire. 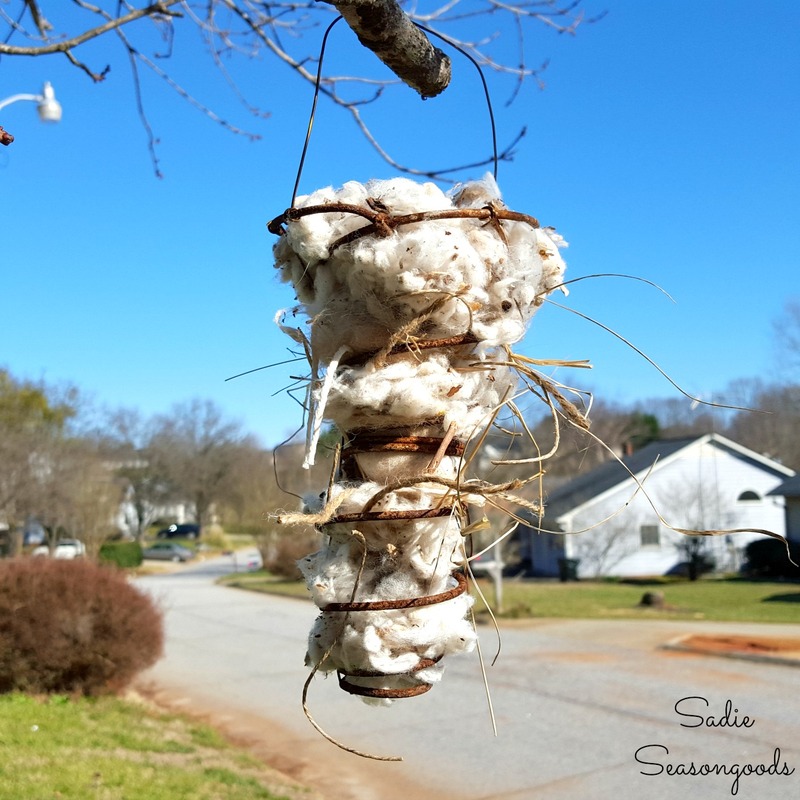 A perfect bird nesting material holder for a birds nest! Ready to hang out in the yard! Then, I hung the bird nesting material holder in our tree! My neighbors probably think I’m just a strange, strange person. Ta-da! Ready for all my feathered friends. I’m so excited to see if I catch any birds using it! Update: THEY LOVED IT! Here’s a video of one of my chickadees pulling bird nesting material from one of my old bed springs! Don’t forget, you can make this easy coffee cup suet feeder project, too- always perfect for the cold winter months while your birds and busy making nests! And for more inspiration for upcycled bird-related projects, please check out my full collection here! Great use of old strings! My kids love doing projects like this and we have old springs in the garage! Thanks for the idea! Okay, this is just too cute–love it! Love seeing the baby birds. So sweet. I remember when I was a kid I would hang bits of yarn out on the little tree in the backyard for the birds. Thanks for popping by, Rose! Seriously… you amaze me. I love this and want to make one! Haha, thanks, Donna!! You know me, I always gotta be a little “out there” with my projects- and you’re right, it’s fluffy enough to pet! 😉 Can’t wait to poke through all of the #DIYMySpring projects! I just saw a bunch of springs at an antique store. Now I know what to do with them. Thanks! Super cute idea, and I’m sure the birdies appreciate it. Here’s hopin’! 😉 Thank you! Sarah, this is such a cute idea! Mom (my mom-in-law) loves loves LOVES her birds. So I definitely will be making one for her. Oh she is going to be so pleased when she sees it!! I want some of that nesting material now for some decor! lol. It has a great look to it! Love your bird nest! What a cute idea! How neat! What a sweet and helpful idea! My aunt places pieces of string and twine on her porch railing for the birds. I’ll have to show her this idea. Visiting from the DIY Spring hop – such fun! It’s a GREAT project to do with kids!! I would have wanted to do this as a 9-year-old, too. 🙂 Thank you so much! This is too cute! Just kicking myself for bypassing a rusty mattress (metal part only). Shoulda clipped some of those springs…. I love this. Such a heart warming project! I am putting out cat hair at random but I’m going to try this construction! I love this idea, and the spring is perfect for this. Thanks for sharing this idea! Well that is just brilliant! Such a clever idea and I think it looks fab. What a great idea! My son attended a super environmentally conscious elementary school years ago and this would have been a perfect project for school children. It’s just wonderful. I saw your link at Diana’s Adirondack Girl at Heart/Vintage Charm party. Thanks so much, Ann Marie- I would have LOVED to have attended such a progressive elementary school- I’m jealous! 🙂 So glad you popped over! Fantastic idea for the birds! So clever! Now how do I get a bedspring, lol! Do you suppose I’d miss it if I took out one of mine?? Awesome idea! I can’t believe this was made from bed springs – and I bet the birds are really appreciating it about now! Your feathered friends must adore you! I am so inspired by your creativity and so happy that you bring it to Celebrate Your Story link party. Thank you! As a bird lover I think this is a fantastic idea! You post was truly a joy to read and I hope that you will continue adding your ray of sunshine every week on Thoughts of Home on Thursdays. What an original idea Sarah. But that doesn’t surprise me, you always come up with original and unique ideas. Thanks for the insipiration and happy Spring to you. Visiting as a fellow blog hopper. What a great idea! Thanks for sharing at the Thursday Favorite Things Blog Hop. Sarah, This is such a great project for our feathered friends! Thanks for sharing your posts with us this week at Snickerdoodle Sunday! Hope you have a wonderful weekend! This is amazing! I love how you created something so unique and needed from the old springs. The birds are loving you. Thanks so much for sharing this at our link party, DI&DI on Sundays. What a neat idea! Everyone thinks of feeding the birds during winter, but I bet this is something that often gets overlooked. Thanks for sharing on the Family Joy link up. Here you go again! You never cease to amaze me with your re-purposing skills! Great job! Thanks, as always for sharing at Celebrate Your Story! Hahaha…your neighbors think you’re weird! I think you’re brilliant. I love this! You’re so thoughtful and I bet your feathered friends will be ecstatic! I LOVE this idea! I picked up an old spring (a car part I think) about a year ago…not knowing what to do with it at the time-but I knew I had to keep it for something. Thanks to you, I now know it’s use. Also, when I clean out my hair brush I toss the old hair in the yard for the birds to use. I plan to make the coffee cup suet feeders too. Yay!!! Your birds will be so happy! Just make sure that the hair from your brush is clean (i.e., no hair products used). Since I use a volumizer spray, I can’t use hair from my brush- thankfully, though, we have a long-haired cat that isn’t treated for fleas/ticks since he is 100% indoors. If only he knew the birds he loves to watch were nesting in his fur…! What a clever idea! I have a couple of old springs I’ve been holding on to. This would be a great use for one of them .